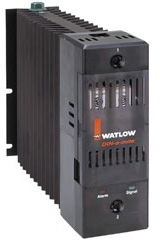 Watlow solid state power switching devices complement the rapid switching required by PID temperature controllers and help deliver optimum system performance and service life. 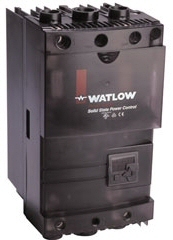 They are available in 1-phase and 3-phase/2-leg and 3-leg configurations, feature touch-safe terminations, input indicators, zero-cross, random or phase-angle fire options, ratings from 18 to 1,000 amperes and agency approvals including CE and UL� 508. Various configurations offer short circuit current ratings (SCCR) of 200,000 amperes, extensive system and heater diagnostic capabilities, heater bake out, integrated heat sinks, on-board fuses, RoHS compliance and serial communications. 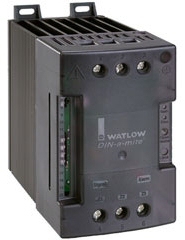 Watlow DIN-A-MITE� SCRs are convenient DIN-rail mount packages while the larger Power Series mounts to the back panel with a Sub Plate.